Atlanta, Georgia (CNN) -- In some parts of the South, Friday's rare snowfall didn't pack the punch anticipated, but it still forced the closure of schools and the cancellation of flights. Cities put emergency crews to work throughout much of the region while state offices and schools were shut down. An estimated 8 inches fell in De Kalb in eastern Mississippi, while 200 miles south in metro Biloxi, snow fell but didn't stick, the National Weather Service reported. "We had flurries for about five minutes where I am, that's it," said John DeMiller, owner of the Petit Bois Grocery in Biloxi. DeMiller's 10th-grade daughter stayed home from school Friday after the Mississippi Department of Education closed all schools due to inclement weather. DeMiller hadn't expected much snow, and when schools were closed in his town without accumulations, he was flabbergasted. "I'm going, 'they just lost their mind,' " he said. Just north of metro Biloxi, though, 1-2 inches fell and black ice could pose a problem as wind chills drop, National Weather Service forecaster Phil Grigsby said. 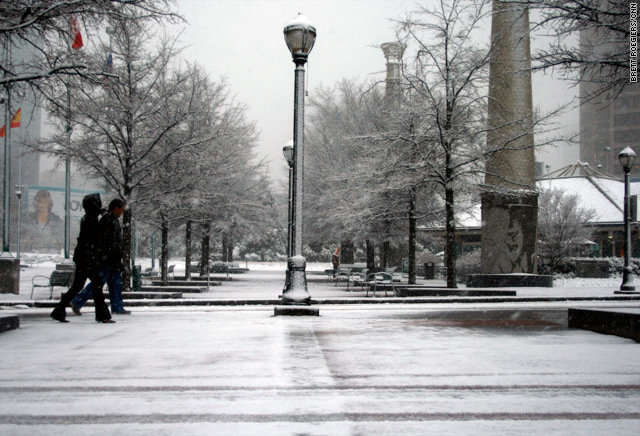 Officials in Georgia were bracing for enough snow to paralyze parts of the state. Atlanta's Hartsfield-Jackson International Airport, which canceled hundreds of flights, had reported 4 inches of snow, National Weather Service meteorologist Dan Darbe said. Numerous accidents have been attributed to the dangerous conditions, he said. Temperatures were to fall to the mid- to upper-20s in the Atlanta area after the snow tapered off sometime between 9 p.m. and 10 p.m. Friday, he said. Traffic accidents were expected to increase as slush turned to ice late Friday, he said. The clear skies already over parts of western Alabama are expected to move into Georgia later this weekend, Darbe said. In Louisiana, Commissioner of Administration Angele Davis announced state government offices were closed in 42 parishes. Earlier in the day, iReporter Susan Sharman in Bastrop, Louisiana, said she couldn't believe snow was falling over her town. "I haven't seen snow like this in Bastrop in over eight years," she said. Metro Baton Rouge, Louisiana, saw about an inch of snow on its streets, while the rest of the area got 1 to 3 inches, Grigsby said. But Mardi Gras revelers don't have much to worry about. The very early morning snow shouldn't interfere with parades Friday evening, he said. Windchills in the 30s, however, mean paradegoers need to bundle up before the fun. Drivers should also be wary of any black ice that may form on bridges and overpasses, he said. Yasamie Richardson of Alabama Emergency Management said conditions could be "very, very dangerous," in her state and the likelihood of power outages was "very great." She said authorities were encouraging people to prepare for the possibility of losing electricity. "My husband and I haven't seen snow since we were stationed in Massachusetts and my children have never seen it," Sara Johnson in Wilmer, Alabama, said in a CNN iReport as the first flakes began to fall Friday morning. The weather system pounded parts of Texas on Thursday, leaving a record 12.5 inches in the Dallas-Fort Worth area. The National Weather Service said the 24-hour total in the area topped the previous record of 12.1 inches set in 1964. "For the DFW Metroplex this is amazing," said iReporter Brent Dow. West of Dallas, in Irving, Texas, Michael Whiteside was awakened at 2:45 a.m. Friday "to the sound of my patio roof collapsing from the weight" of the snow, he said in a CNN iReport. At Dallas/Fort Worth International Airport, where American and American Eagle canceled about 230 flights, officials were working to ramp up departures Friday. An Airport spokesman said Friday afternoon that most flights were running on time. There was some relief in sight for the South. Warmer weather was melting the snow Friday in Dallas, and temperatures in the 40s were expected to move through the rest of the region over the weekend. The Southern states were getting a smaller dose of what their Northeastern and mid-Atlantic counterparts have experienced this week. That area is digging out from a pair of record-setting blizzards. The first storm dumped more than 30 inches of snow in some places last weekend, while the latest part of the one-two punch dropped 22.5 inches on Baltimore, Maryland; 15.8 inches on Philadelphia, Pennsylvania; and about 10 inches on Ronald Reagan Washington National Airport in Arlington, Virginia; Central Park in New York; and Atlantic City, New Jersey, the National Weather Service said. Records for total snowfall for the season have been set at Dulles International Airport west of Washington, with 72 inches; Philadelphia, with 70.3; Baltimore, with 70.1; Reagan Washington National Airport, with 55.6; and Atlantic City, with 48.7, according to the weather service. CNN's Dan Gilgoff and Khadijah Rentas contributed to this report.